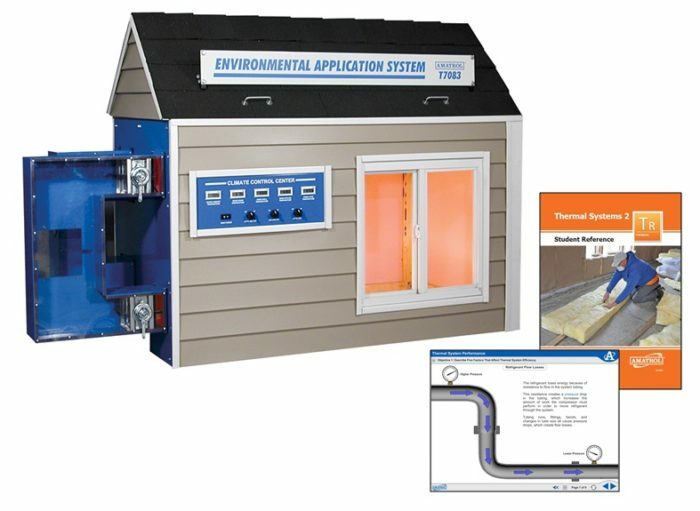 The Environmental Applications Learning System (T7083), an expansion for the Air Conditioning / Heat Pump Operations Learning System (T7082) or the Air Conditioning / Heat Pump Troubleshooting Learning System (T7082A), is a model of a house complete with insulation, siding, shingles, and a window. Learners gauge how these features affect a home’s temperature by checking digital thermometer outputs connected to various temperature probes throughout the trainer. Learners then use components such as a ceiling fan, attic exhaust fan, attic vents, and static cling window tint to change the home’s temperature and to learn about concepts like heat loads, insulation effectiveness, humidity, air movement, heat transfer, psychometrics, and heat pump sizing. When connected with one of the Air Conditioning / Heat Pump systems via a duct system, learners can use real-world instruments to measure and adjust the temperature within this scaled home replica. This combination of trainers will serve as an unparalleled learning experience for anyone in the HVAC or home construction field. Simulate Environmental Variables and Study Their Effect on a House! Amatrol’s Environmental Applications system uses an assortment of components, such as a heater, humidifier, and 500 watt lights to simulate environmental impact on home temperature and learn applicable skills like plotting a dehumidification process on a psychrometric chart. The Environmental Applications system allows learners to simultaneously monitor the inner room temperature at the floor, mid-room, and ceiling levels; inner wall temperature; and attic temperature for a greater understanding of how different elements affect separate parts of the house. This is accomplished by using pre-mounted temperature sensors that are connected to digital outputs, so there’s no need to open the house and adversely affect your data! Power switches for the attic fan, ceiling fan, and attic heater will allow learners to practice skills like changing the air flow within a thermal system without opening the window and evaluating the effects of attic space conditioners on a thermal system. Widely known for world-class curriculum, Amatrol worked closely with industry leaders and educators to produce unmatched learning materials for environmental applications that can be self-guided or taken in a classroom environment. Environmental Applications curriculum begins with the basics of thermal system performance before moving into more advanced areas, such as external and internal heat loads, thermal insulation effectiveness, humidification operations, air handling systems, and air conditioner/heat pump sizing. This curriculum is highly interactive multimedia that utilizes text, audio, and stunning 3D animations. As a specific example, learners will complete a load estimating form and then size a heat pump system given an application. A sample copy of the Thermal Systems 2 Student Reference Guide is included with the system for your evaluation. Sourced from the Environmental Applications multimedia curriculum, the Student Reference Guide takes the entire series’ technical content contained in the learning objectives and combines them into one perfect-bound book. Student Reference Guides supplement these courses by providing a condensed, inexpensive reference tool that learners will find invaluable once they finish their training making it the perfect course takeaway. If you would like to inquire about purchasing additional Student Reference Guides for your program, contact your local Amatrol Representative for more information.